The Whitewalls rocked the opening slot for The Telephone’s CD release party! We’ve played with them before with Rebecca’s band, and DIG what they do for sure! We made some great friends and contacts and had a blast doing it! What a night to do it ON as well in the epicenter of INDIE…Williamsburg… A rockin’ Brooklyn eve no doubt! Happy St. Patrick’s day! Here at The Grand Victory we’re going to continue America’s long-standing tradition of embarrassing ourselves in front of anyone who might actually be even the tiniest bit Irish. The best way to do that is to offer a Guinness and a shot of Jameson for $10 ($9 during happy hour). 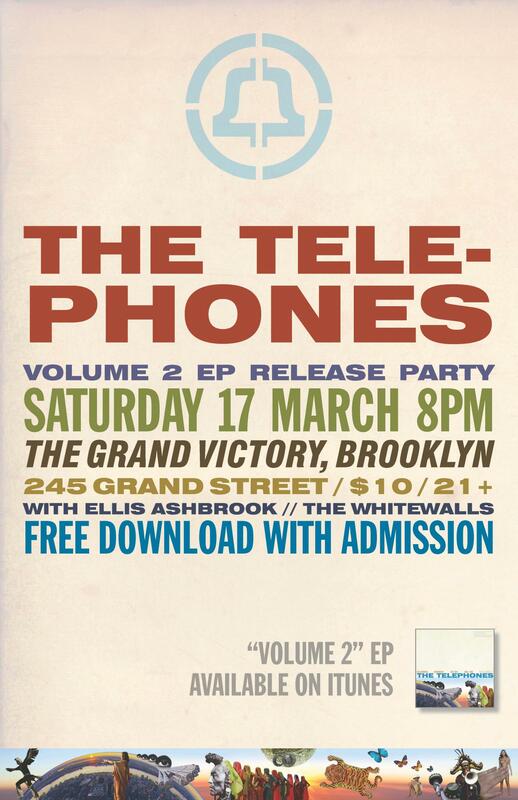 Later tonight we’re hosting the CD release party for The Telephones, as they celebrate the unveiling of their second full-length, aptly titled Volume 2. Appearing before them will be Ellis Ashbrook and The Whitewalls. Doors at 7:00, $10 cover. After the show we’ll open the doors to everyone for free, as Chris Kent spins celtic punk, pub punk, and straight up drinking songs. If you spend St. Patrick’s day anywhere else, you’re missing out. 10:00 PM — The Telephones say of themselves that “their influences range from Bob Dylan to The Pixies; Muddy Waters to Pavement; Big Star to T. Rex; Tom Waits to Guns and Roses.” Time Out New York calls them “[r]evved up new wave [with] poignant lyrics [and an] oddball sense of humor.” New York Press credits them with “[h]aunting vocal[s], fictional plots [and] intense playing.” We think all of this, actually, quite accurate. It’s well done contemporary rock and roll with slick production, edginess and a kind of classic throwback all tossed in a blender then rendered, with one light touch of the “pulse” button, quite chunky. Listen here. 9:00 PM — “Take one listen to Ellis Ashbrook and immediately you will feel like you’ve been transported back to the 1960s,” says Visionary Artistry Magazine. “The psychedelic pop and rock music that reigned over the era has been updated and reintroduced.” Last.fm calls them “genre-bending rock that exhibits fiery eclecticism rooted in solid foundations of funk, soul and blues.” They bill themselves as “exploratory rock.” We’d call it druggy funk. To us they sound like early Red Hot Chili Peppers, had the Peppers’ drug of choice been LSD instead of smack. Listen here. 8:00 PM — The Whitewalls is what’s left over of the band Licorice. We listened to some of their live recordings and immediately determined they sound like a cross between Laughing Stock era Talk Talk and early Karate, with breathy, earnest vocals and hints of straight up classic rock riffs. Listen here. ~ by dlottmusic on March 19, 2012.